We must remain resolute in our peaceful quest for Biafra freedom. I must use this medium to console, congratulate and encourage our mothers, wives and sisters whom the Imo state commissioner of police in full collaboration with the State governor, Anayo Rochas Okorocha have done their worst by teargassing, beaten, locking and denying our mothers access to decent food and medications. We want the international community to know that these mothers and grandmothers committed no offence under the laws of the land, they were merely exercising their fundamental rights to freedom of assembly as enshrined in the Nigerian constitution. We want the world to know that the state police used highly disproportionate force on these harmless mothers, and still went ahead to detain them under very inhuman jail conditions, denying them visits from their husbands, sons, daughters and other relations. Most of these mothers are nursing babies and could not feed their little infants since Friday, August 17, 2018, till today August 23, 2018. 1 week of assault on our mothers and still counting, while our southeast franchise politicians look the other way. This shows the level of sabotage from Biafran politicians and the so-called Igbo leaders/elites. Can you in your wildest imagination touch an Hausa (Muslim) mother let alone keeping her under such derogatory conditions? No, it's impossible. Igbo cash and carry politicians/elites have now confirmed a statement once made by the sitting Kaduna State Governor, Mallam Nasir el Rufai; that the unproductive, uneducated good for nothing Northern citizens are superior to their eastern counterparts. Ndi-Igbo, Ndo nu. SORRY! Nnia Nwodo and his Ohanaeze Ndigbo should hide their face in shame. From now on you should expect more peaceful protest all over the places, go and build more jail houses the women are coming. Remember the Aba women riot of 1929 and it’s consequences, the women are bringing the fight to your doorsteps, our mothers are determined, even more determined than our Onyedu Mazi Nnamdi Kanu. 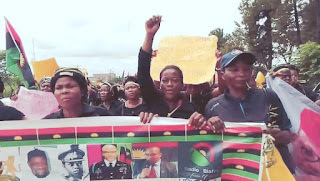 Our gallant mothers remain resolute, give them more protest in all southeastern states, the world is watching, it is better to die a free man than to continue living as slaves to the Northern oligarchy supported by evil Britain. Have it at the back of your mind that you have broken no laws and you are never criminals, rather, those keeping you captive are the CRIMINALS known around the world as world class criminals who commands no respect around the world. On a final note, this expired entity called Nigeria should know that there is nothing they can do to make the Indigenous People of Biafra ( IPOB ) worldwide to change it's timetable of events of things to come. We must follow our lay down schedule of things, the way we want it and not the way Nigeria wants it no matter how hard they try to kill, jail, torment or provoke IPOB, you can never dictate for us, rather what remained of the contraption called Nigeria must continue to do our bidding. We are more intelligent, more sophisticated and more determined. Always ahead of Nigeria in every step.